You probably don’t remember me. I was that scrawny freshman kid on your cross-country team at Bridgeport High School. I wasn’t very good as high school cross country runners go, and that in a region where cross country wasn’t a big deal for anyone; it was all about football, as I remember. There were only 5 of us on the team. Frank was the star. Even as a sophomore, he placed in the top 10 in the state meet. In fact, it was mostly due to Frank’s first place finish at districts that we even made it to the state cross country meet. If Frank was the star, I was the complete opposite. I rarely finished the workouts without walking. The rest of the guys were in the showers already by the time I got back. I usually didn’t finish any of the races without walking, and I know I was one of the last runners to cross the finish line at the state meet. I’m pretty sure I was an embarrassment to you; at least that’s what I felt like. I really didn’t like running, and I especially didn’t like being pushed so hard that it hurt. So, I quit. Not the team, but the workouts and the races. When it started to hurt, I started to walk. It made sense to me. When it didn’t hurt so much, I started running again. Like I said, I didn’t like running very much. My dad had convinced me that being on the cross country team would get me in good shape for the basketball team, which was the sport I really liked. I wasn’t very good at that either, though I did make the team and did a good job of cheering the starters from the bench. I guess on some level I liked being part of the team, even though, as I remember, I didn’t feel that much a part of the team. I liked the trips to the races; I really enjoyed the state meet, but I don’t remember ever feeling like I contributed anything. Probably because, in concrete terms, I didn’t. Our score was based on the cumulative total of the five top finishers. Since we only had five on the team, my consistently end-of-the-pack score didn’t help the team very much. I might add, however, that if there had been only four on the team, we would not have been scored as a team and we would not have been eligible for the state meet; Frank could have run as an individual qualifier, but the team would not have gone. There is that. So here’s the funny thing. I’m 52 years old, and I’m still running. Imagine that! When I got to college, I discovered that running at a more leisurely pace for a half hour or 45 minutes was actually enjoyable, and a good antidote to the hours of sitting in class and in the library. It became a way to clear my mind and to decompress a little. As time went on, I began entering 5K races, a 10K race here and there, and found a whole community of people who ran for the fun of it. Over the years, I’ve loved being a part of that community. In my 30’s, still running, after I was married and had a new baby, I even convinced my wife to start running, a physical activity that she was convinced she hated, and now she is still running 4 times a week into her 50’s, and enjoying it. 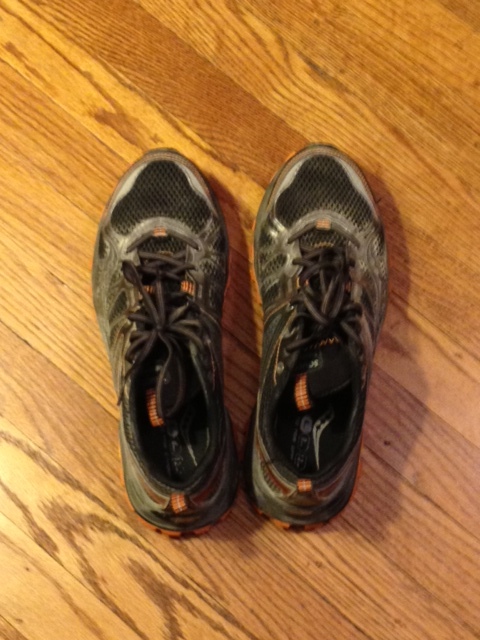 Through the years there have been brief periods when I have quit running. Felt it was too hard on my body, got too busy, or just found other ways to get exercise. But running is the thing I always come back to. I’m still not very fast. But I do it consistently, and I can even finish a workout without walking. I’m sure you would be happy about that! The even more amazing thing is that about 5 years ago, I started running marathons. Crazy, huh? The kid who couldn’t run 4 miles without stopping is now running 26? I know, it doesn’t make sense. But I’ve run 1 or 2 marathons a year for the past 5 years and I can’t imagine my life without it. It keeps me disciplined, it keeps me in a relative degree of well-being, and I simply cannot describe in words the feeling of elation, exhilaration, and accomplishment when I cross the finish line after 26 miles. I will probably never qualify for the Boston Marathon. But I finish. And that means a lot to me. So, I just thought you might want to know that maybe the point was not how I did or didn’t fit into the competitive culture of high school sports – even though back then it was way, way, way less intense than it is these days. Maybe the point is to cultivate some ability to recognize exercise and some kind of physical activity as a fundamental component of living well. I’m not so sure that’s what you had in mind. But I am grateful that the seeds planted in a scrawny, no-good-to-the-team runner have taken root and grown into a lifelong pursuit of fitness and well-being. This entry was posted in Uncategorized on October 11, 2012 by Jim Honig.